Describing depression to those who haven’t experienced it can be clumsy. The analogy I’ve found that best embodies my experience is “cloudy days.” The sun is still there but I’m unable to access that light. Instead, I’m cold and muted. Sometimes it’s cloudy for so long it’s hard to remember what the sun looks like. Sometimes it’s hard to believe the sun is there at all. As someone who has battled depression for years and intimately understands the pain surrounding suicide and mental illness, I want my art to make a statement about this epidemic. Art is visceral and can describe an effect or experience in deeply powerful ways. This, and my drive to grow as an artist, pushed me to complete a minor in fine arts as an undergraduate at Cornell University. My installation, “Schism,” is featured in Still I Rise, an exhibition curated by Laura Rowley with the work of 12 artists on view at the Tompkins County Public Library from July through September. “Schism” deals with the pain of losing loved ones to suicide, commenting on the profound hole the deaths leave behind. With rising mental health concerns among my generation, the ability to outwardly mourn for people who die by suicide is incredibly important along the path to healing. Yes, suicide is a sensitive topic. No, this doesn’t mean we shouldn’t talk about it. Treating suicide as a taboo topic not only stunts the healing process for suicide loss survivors, but teaches those plagued with suicidal thoughts that it’s something to be ashamed of, a weakness, which can deter them from seeking support. Open and empathetic conversation is critical to combat such tragedy. “Schism” contains three sculptures. Each is a life-size, wooden silhouette of a suicide victim that is painted black with the best runner up to Vantablack commercially available, Black 2.0. It’s a special paint that is meant to absorb a higher percentage of light, creating the visual effect of “a schism in space.” This is meant to convey the loss felt when someone is a victim to suicide, to reveal the hole that remains in their physical shape in space they inhabited in life. This installation is designed to represent loss of the individual, as each sculpture is a personalized and unique silhouette. Further, it is intrinsically connected to Ithaca as the individuals represented were all affiliated with the area: Sophie Hack MacLeod, 23, a Cornell fine arts major; Jason J. Seymour, 40, a Cornell systems analyst; and Alexander Joseph Reposh, 25, an Ithaca filmmaker and musician. When someone is having suicidal thoughts, it’s far too easy to think, “I don’t matter, no one will even miss me, what’s the point? It’s suffocating.” I hope that “Schism” can be a reminder to those experiencing suicidal thoughts that your life is not trivial but is something to be cherished. “Schism” is also a symbol for those mourning a loved one and the horrific loss they must cope with. Brianna Evans is a 2018 graduate of the College of Agriculture and Life Sciences at Cornell University. “Schism” was created as an independent study project supervised by Professor Roberto Bertoia of the College of Architecture, Art, and Planning. She wishes to thank The Sophie Fund, and the families of Sophie Hack MacLeod, Jason J. Seymour, and Alexander Joseph Reposh, for their support. Ithaca and Tompkins County are among the American localities severely affected by the opioid crisis, prompting intensified efforts by local officials. Overdoses are a common occurrence, and authorities report an average of 15 drug-related deaths a year since 2011. In 2016, the number skyrocketed to 21, compared to two deaths in 2007. Trump said he was “directing all executive agencies to use every appropriate emergency authority to fight the opioid crisis,” but was short on specifics, mainly rattling off various steps that the federal government had previously taken. Trump made no mention of two factors that experts increasingly see as fueling the addiction epidemic—pharmaceutical companies pushing legal opioids, and a national mental health crisis in which people desperately seeking relief from depression and anxiety find relief in opioids. Also in June, the Washington Post’s Lenny Bernstein reported on a study by researchers at the Dartmouth-Hitchcock Medical Center and the University of Michigan that linked greater opioid use and mental health disorders. The researchers concluded that 51.4 percent of 115 million opioid prescriptions written annually in the United States were given to people with anxiety and depression. “Those patients may have some form of physical pain, said Brian Sites, a professor of anesthesiology and orthopedics at Dartmouth’s Geisel School of Medicine, who led the study team. But their mental condition may cause them to feel that pain more acutely or be less able to cope with it, leading to increased requests for something to dull it. “Pain that ‘you may report as a two out of 10, someone with mental health disorders — depression, anxiety — may report as a 10 out of 10,’ Sites said in an interview. In addition, opioids may improve the symptoms of depression for a short while, he said, with patients who experience that then asking for continued refills. Trump’s declaration of a “public health emergency” did not involve the release of emergency federal funding, but the White House indicated that the president would soon ask Congress for additional funding to combat the opioid crisis. Trump’s Commission on Combating Drug Addiction and the Opioid Crisis, chaired by Governor Chris Christie of New Jersey, will hand Trump its final report and recommendations next week. “Andrew Kolodny, the co-director of opioid policy research at the Heller School for Social Policy and Management at Brandeis University, said that no emergency declaration would do much to alleviate the impact of opioids without a substantial commitment of federal money and a clear strategy for overhauling the way the country treats addiction. “‘This is a business plan. They are liable,’ Manchin told CNN’s Jake Tapper on ‘The Lead’ when asked if he believes the pharmaceutical industry needs to be found legally liable in some cases for the prevalence of opioids in the United States. “Manchin added that the companies that supply opioids should be charged fees for the drugs they produce and for having inundated the market with the highly addictive drugs. “‘This is what’s caused it. Can’t we at least charge the pharmaceutical companies one penny per milligram for every opiate they produce?’ Manchin added. Consider sharing this post. It’s National Suicide Prevention Week— please take a moment to review the Risk Factors and the Warning Signs as they may apply to loved ones, friends, colleagues, or even yourself. 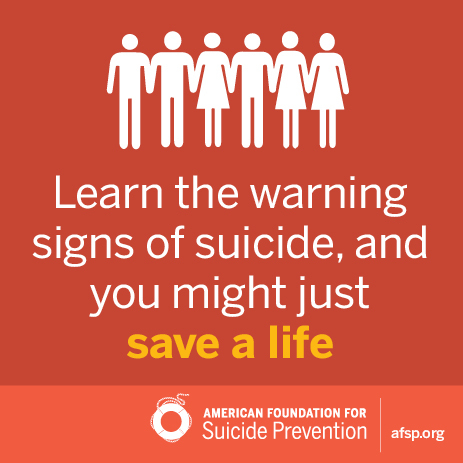 Click here for the Risk Factors/Warning Signs page of the American Foundation for Suicide Prevention. People with Risk Factors or exhibiting Warning Signs are strongly encouraged to seek treatment—suicide is preventable. If you or someone you know feels the need to speak with a mental health professional, please consider contacting the National Suicide Prevention Lifeline at 1-800-273-8255. Health Risk Factors—such as mental health conditions, substance abuse disorders, or serious/chronic health conditions and/or pain. Environmental Risk Factors—such as stressful life events, prolonged stress conditions, access to lethal means, and exposure to suicide. Historical Risk Factors—such as previous suicide attempts. Be aware of Warning Signs. 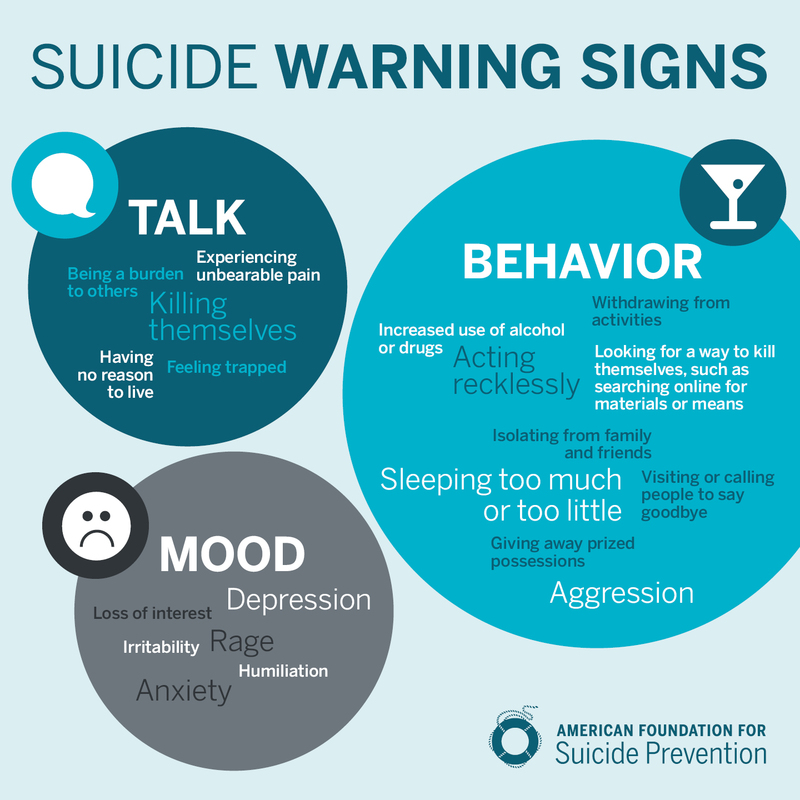 According to AFSP, most people who take their lives exhibit one or more warning signs, either through what they say or what they do. Warning Signs relate to a person’s Mood—displaying one or more moods such as depression, loss of interest, rage, irritability, humiliation, anxiety. Warning Signs relate to a person’s Behavior—such as increased use of alcohol or drugs, aggression, acting recklessly, withdrawing from activities, isolating from family and friends, sleeping too much or too little, visiting or calling people to say goodbye, giving away prized possessions, and looking for a way to kill themselves. How to help someone who may be struggling: click here for guidance from the American Foundation for Suicide Prevention. Click on the infographic below to download a Warning Signs checklist.